Buildings that strive to meet LEED standards are increasingly used to teach students and visitors more about sustaining the world around them. When the Virginia Wesleyan University Greer Environmental Sciences Center was in early design, the phrases “science on display” and “identifiable sustainable features” were used in every meeting. Farther along in the project, it has become clear that unlike many other LEED buildings, this facility will stand out. VMDO Architects designed the Center as a testament to both the environment and education. This facility will teach students and visitors the possibilities of working, learning, and living in harmony with the environment. Features of the building that engage natural systems, attract wildlife, and create compelling interior and exterior spaces will inspire a sense of place, connecting occupants in powerful ways to their local ecological community. The building and its landscape will conserve resources and operate, in visible and measurable ways, in accord with its ecological environment. These strategies will teach important principles of environmental stewardship, including the interconnection of humans and natural systems, care for local watersheds, and strategies to understand and combat climate change. For example, the polished concrete flooring throughout the open spaces of the building highlights the beauty of doing more with less. Instead of covering the structurally required concrete with other flooring types, the decision was made to leave the concrete exposed and polished to cut costs and conserve the resources that would have otherwise gone into making the material. Once forgotten at the bottom of the Mississippi River, “sinker cypress” is used throughout the interior and exterior of the building. The reclaimed wood has been clear-coated to allow the natural beauty of the material to show through, emphasizing the value of repurposing “wasted” material. The constructed stormwater wetland areas are designed to mimic natural hydrology with native wetland plant selections that are typical of wetland restoration projects. The native vegetation is excellent at soaking up floodwaters and stabilizing banks for protection against erosion. They also trap many pollutants absorbed from the water and prevent them from spreading or contaminating local waterways. LEED Buildings like the Greer Environmental Sciences Center are now being used as a medium for environmental education, allowing users to get involved in the performance of the building. Because many people have never interacted with these strategies (such as a photovoltaic system or a green roof), it is difficult to portray how they are demonstrating environmental stewardship. To help bridge the gap, the building dashboard (located in two common areas, one on each floor) will feature live data on the building’s performance, such as energy consumption, energy generation from solar panels, and resource usage. 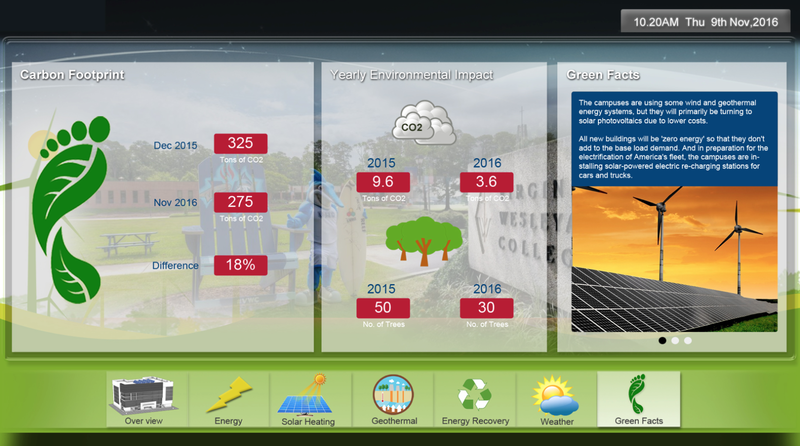 For students, staff, and visitors, the dashboard shows what impact the building and its occupants have on the production of greenhouse gas emissions and resource use. The dashboard will also feature a “Green Facts” section with tabs highlighting the identifiable sustainable features to be explored throughout the building and landscape. Additionally, extensive interior and exterior signage help guide and educate occupants on the building’s sustainable features and their impact on the environment. Because the environmentally-sensitive features of the building are easily accessible, the building will engage students’ curiosity and create opportunities for research. Once completed, the building will have the capacity to attract students with a passion for the environment while stimulating grassroots involvement in conservation. The building can be considered a three-dimensional textbook for environmental stewardship, conservation efforts, and the functioning of a green facility in use each and every day. As the Sustainability Program Analyst, Sydney has been leading the Sustainable Construction certification processes on many commercial and federal projects, including the Greer Environmental Sciences Center. She is connecting green building practices and corporate sustainability to help guide the organization to a more sustainable business model. 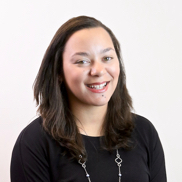 Sydney currently serves on the Market Leadership Advisory Board for the USGBC-Hampton Roads Community, as well as the Program Partners Committee for the Lynnhaven River Now, and the Hampton Roads Corporate Volunteer Council.